Levine Museum of the New South recently opened a new series titled, Destination Freedom: Civil Rights Struggles Then and Now, that will feature several different exhibits and programs over the next two years. The first three exhibits are on display now, and I had the opportunity to check them out a few weeks ago during a members' preview. The museum is holding an official kickoff event this Sunday, September 15 that you should check out. And even if you can't make it out that day, you'll want to make plans to visit the museum in coming months. 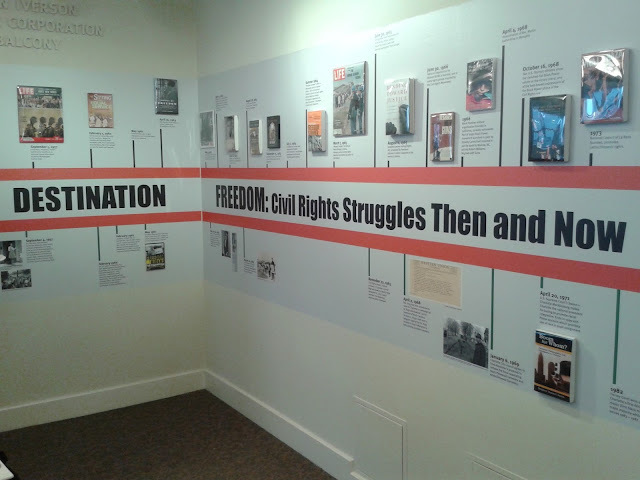 Destination Freedom is Levine Museum's commemoration of several important milestones in the Civil Rights Movement that are each approaching 50th anniversaries between 2013 and 2015: The March on Washington and Dr. Martin Luther King Jr.'s "I Have a Dream" speech (August 28, 1963); the bombing of the Sixteenth Street Baptist Church and murder of four young girls in Birmingham (September 15, 1963); the signing of the Civil Rights Act of 1964, which ended segregation in public places (July 2, 1964); and the passing of the Voting Rights Act of 1965 (August 6, 1965). Those historical moments alone signify the importance of the exhibits, but as Levine Museum so greatly does with many of its exhibits over the years, it's presenting them in though-provoking ways along with scheduled events, corresponding programs, and dialogue sessions. This Sunday is the Destination Freedom Kickoff, an event that's free and open to the public, beginning at 3 p.m. There'll be a panel discussion featuring David Forbes, SNCC member, Raleigh Hall of Fame inductee; Juan Carlos-Ramos, United for the Dream; Dorothy Counts-Scoggins, 1957 desegregation of Harding High School; Tiffany Flowers, director at KIPP Charlotte; and Joshua Burford, LGBT historian researcher, UNCC Multicultural Affairs; and will be moderated by Irving Joyner, NCCU legal scholar and Legal Eagle Review co-host. After the panel discussion, you'll get to enjoy a reception with entertainment by Latanya Johnson and the Sycamore Project, and tour the new exhibits. Then at 6 p.m., at First United Presbyterian Church, which is directly across the street, the museum is presenting a keynote address by Diane Nash. Nash is a Civil Rights activist and co-founder of the Student Nonviolent Coordinating Committee (I learned a lot about SNCC during my Afro-American Studies classes in college), and she'll reflect on 1963 and the lessons for today. Sunday's activities are free, but reservations are requested at 704-333-1887 ext. 501 or rsvp@museumofthenewsouth.org. If you can't attend on Sunday, you should make a point to visit the Destination Freedom exhibits soon. Whenever I experience these kinds of things, they always remind me how important history is to what we encounter today. 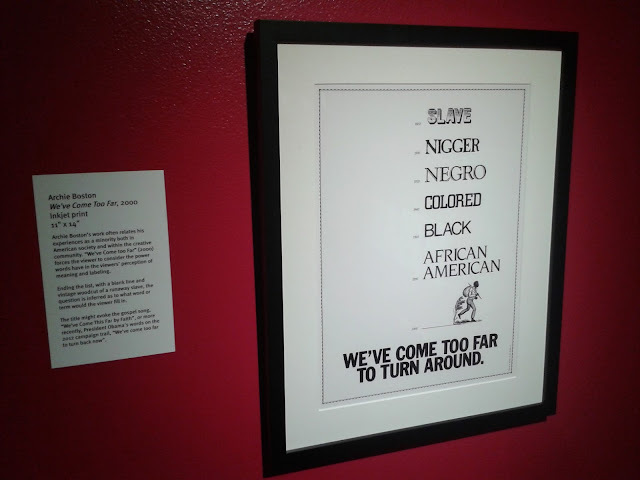 These exhibits, in particular, will show you how much progress in racial equality this country has made over the last 50 years. And while it would be natural to focus on the work that still needs to be done or to complain about things that still aren't fair, I'm inspired by the incredible hurdles and hardships that people before me overcame--it took people of all walks of life to work together--which makes many of the problems we face as a society today seem petty and disrespectful to the path that's been laid before us. I was also inspired from talking to a teenager at the preview event a few weeks ago. She's a high school senior who participated in "A Ride for Understanding," the four-day, four-city Civil Rights bus tour across the Southeast that Levine Museum took 15 students on over the summer. 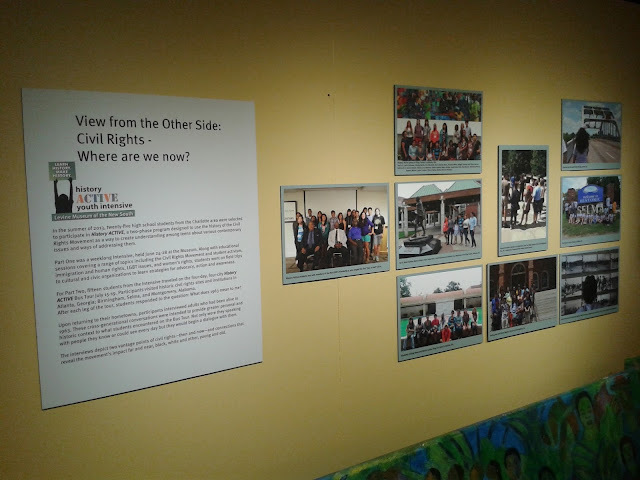 Part of their experience is documented in the View from the Other Side exhibit that's featured in Destination Freedom. I was inspired by my conversation with the young lady because she, who's white, took an interest in a part of history that's far too often described as "Black History" when it is more American history than just about anything else. Plus, she reminds us that kids today don't harbor the same feelings about race that their parents and grandparents might. They're growing up having friends of all colors, listening to the same music, and sharing similar experiences. So they shouldn't be saddled with views that have been skewed by things they'll never have to experience. 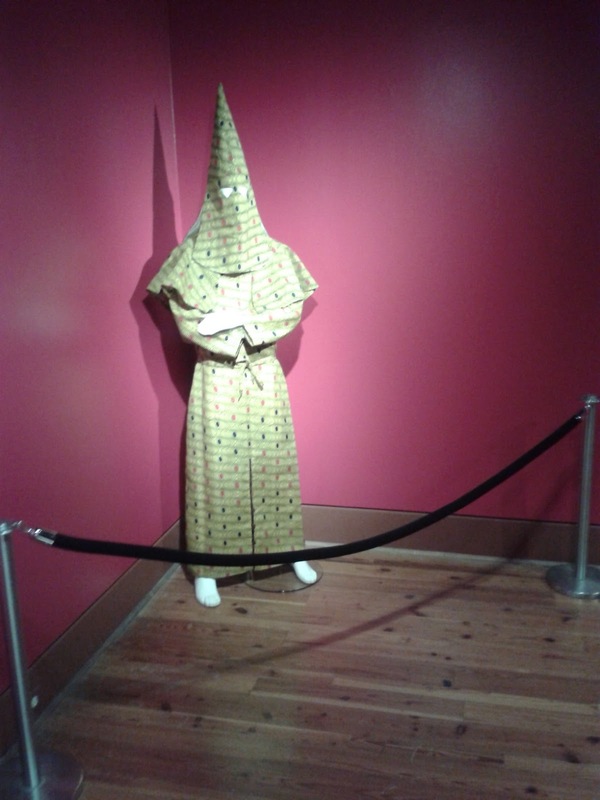 These exhibits help them realize how fortunate they are, but also why justice and equality are things that have to be tended to in order to be ensured and preserved. Synopsis: Featuring provocative works by leading contemporary artists and designers, who carefully examine the various social conditions and components that energized the Civil Rights Movement of the 1960s, as well as continue the dialogue of race and equality in today's society. Synopsis: Curated by photographer Byron Baldwin, the exhibit includes photographs documenting the regional Civil Rights Movement as seen through the eyes of Carolina photographers Don Sturkey, Bruce Roberts, James Peeler, Cecil Williams, and others. Synopsis: Artists and students present works informed and inspired by issues of civil and human rights. Featuring pieces from local artists TJ Reddy, Rosalia Torres-Weiner, Mikale Kwiatkowski, and Antoine Williams, along with pieces from Performance Learning Center and History Active students. Levine Museum of the New South, 200 E. Seventh St., 704-333-1887, museumofthenewsouth.org, facebook.com/LevineMuseum, Twitter @LevineMuseum. Thanks for sharing this informative blog! I have been to Levine museum four years ago with a colleague trip. It is really a nice attraction in North Carolina, but I didn’t know about Destination Freedom before reading this blog. Now I wish to visit this museum again after my upcoming weekend bus tours grand canyon. Can you update me more about the current exhibitions and galleries of Levine Museum? Destination Freedom will create a solid history of the movement for civil rights and the parallels to today. As well as on weekends and for evening events, the museum provides parking validation, with no hourly limit. Visitors should present parking ticket for validation at the Guest Services desk upon arrival. However June I recommend to you this site http://www.museumofthenewsouth.org/calendar/detail/?ProgramId=505&OccurrenceId=637 to learn the history and exhibitions of the Museum.